3-Edwin Allen (Tas) Cocker was born on 5 Jun 1879 in Port Sorell, died on 7 Aug 1944 in his residence, Burnbrae, Invercargill, New Zealand at age 65, and was buried on 9 Aug 1944 in Eastern Cemetery, Invercargill, Southland, New Zealand. Edwin married Dora Maude Fortune, daughter of James Fortune and Sarah Jane, on 17 Dec 1908 in Orepuki, Southland, New Zealand. 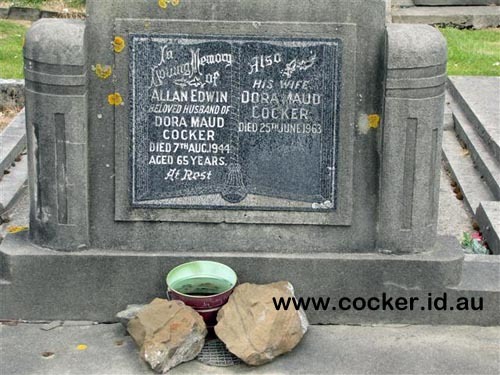 Dora was born on 31 Jan 1883 in Orepuki, Southland, New Zealand, died on 25 Jun 1963 in Invercargill, New Zealand at age 80, and was buried on 27 Jun 1963 in Eastern Cemetery, Invercargill, Southland, New Zealand. 4-Melva Rebecca Jane Cocker was born on 19 Jan 1910 in Mouton Grove, Ryal Bush, New Zealand. Melva married James Jordan. They had three children: Jennifer, Gillian and Blair. 4-Kingsley Fortune John Cocker was born on 4 May 1912 and died in 1980 in New Zealand at age 68. Kingsley married Hilda Jackson. They had three children: Everill, Margaret and Murry. 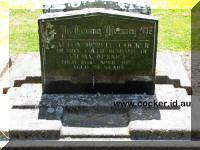 4-Marjorie Cocker was born in Launceston and died about 1918. Marjorie married Durock Allan. They had five children: Raymond, James, Garry, Dexter and Peter. 4-Dora Maude Cocker was born on 6 Sep 1914, died on 19 Feb 1922 in Timaru, South Canterbury, New Zealand at age 7, and was buried on 6 Mar 1922 in Timaru Cemetery, South Canterbury, New Zealand. Dora married John Francis Forde, son of John Francis Forde and Gertrude Amelia Lynch. John was born on 31 Mar 1914 in Collingwood, Invercargill, New Zealand, died on 25 Sep 1989 in Timaru, South Canterbury, New Zealand at age 75, and was buried on 28 Sep 1989 in Timaru Cemetery, South Canterbury, New Zealand. They had three children: Brian, Jocelyn and Kevin. 4-Raymond Allan Everill Cocker was born on 6 Nov 1916 in Ryal Bush, Southland, New Zealand, died on 29 Jun 1984 in Christchurch, New Zealand at age 67, and was buried on 3 Jul 1984 in Ruru Lawn Cemetery, Ruru Rd, Bromley, Christchurch, Canterbury, New Zealand. Raymond married Kathleen Theresa Allen. 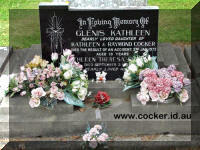 Kathleen was born on 28 Aug 1922, died on 2 Sep 1985 in Invercargill, New Zealand at age 63, and was buried on 5 Sep 1985 in Eastern Cemetery, Invercargill, Southland, New Zealand. They had five children: Allan, Patricia, Judith, Glenis Kathleen and Michael. 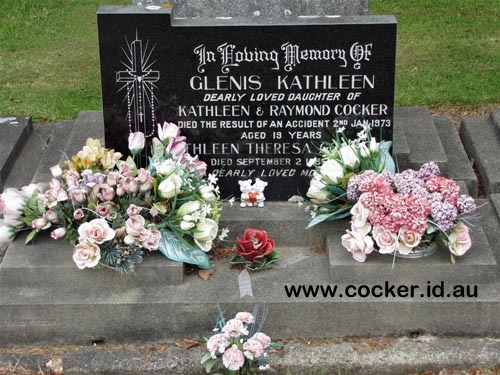 5-Glenis Kathleen Cocker was born in 1953, died on 2 Jan 1973 in Sydney, New South Wales at age 20, and was buried on 11 Jan 1973 in Eastern Cemetery, Invercargill, Southland, New Zealand. 5-Michael Cocker was born on 14 May 1958 in Invercargill, New Zealand. Michael married Cathryn Ann Steel. Cathryn was born on 18 Feb 1964 in Blenheim, New Zealand. They had two children: Grace Kathleen Steel and Hannah Jane Steel. 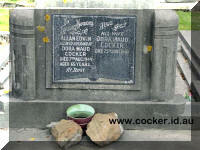 4-Brida Maud Cocker was born on 20 Jan 1921 and died in 2003 in New Zealand at age 82. Brida married Kemble Wingham Roderique. Kemble was born on 10 Dec 1921 and died in 2007 in New Zealand at age 86. They had two children: Cheryl and Dallas. 4-Trevor Cocker. Trevor married Sheila McDougall. They had four children: Raymond, Terry, Dorita and Graham. 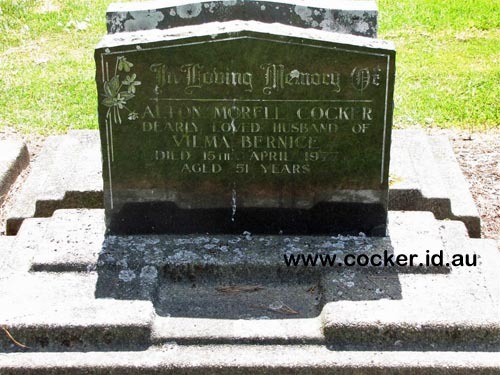 4-Alton Morrell Cocker was born on 11 Oct 1925 in Invercargill, New Zealand, died on 15 Apr 1977 in Invercargill, New Zealand at age 51, and was buried on 18 Apr 1977 in Eastern Cemetery, Invercargill, Southland, New Zealand. Alton married Vilma Bernice Wilson. They had four children: Kingsley, Michele, David and Adrian. 5-Kingsley Cocker was born on 13 Feb 1951. 5-Michele Cocker was born on 3 Aug 1952. 5-David Cocker was born on 8 May 1957. 5-Adrian Cocker was born on 25 Aug 1961.